If you live in Seattle, odds are you drink coffee. As the birthplace of Tully’s & Starbucks, we like our morning buzz more than just about anything, except maybe our afternoon pick-me-up. But is this way of life affecting more than our energy levels? Studies warn caffeine can negatively impact our sleep. Is it possible to find balance? The good news is yes! But you need to understand how caffeine works, and use it to your advantage. You wouldn’t want to end up “Sleepless in Seattle”, now would you? Leave that to Tom Hanks and Meg Ryan. How much caffeine does your body need? 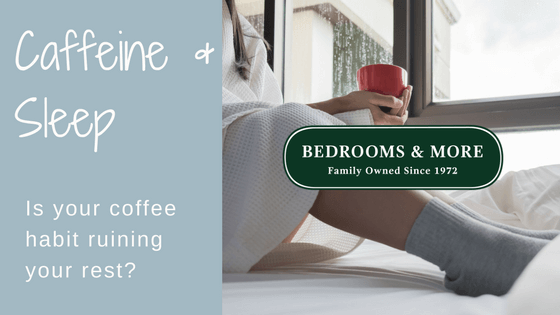 This question is a bit misleading because our bodies do not require caffeine to function. However, the amount we need to feel the positive effects varies depending on tolerance level, much like any other drug. According to the Mayo Clinic, 400mg of caffeine per day is considered safe. The average cup of coffee contains approximately 100mg. Think about that. If you enjoy coffee, drinking more than four cups in one day isn’t difficult; at least not from where I’m standing. Thankfully, to lethally overdose on caffeine, you would need to consume around 10 grams over a short period of time. That’s roughly 3 gallons of coffee! Even during my most stressful college days, that would have been quite a feat. To help prevent caffeine intake from negatively affecting your sleep, make sure not to mindlessly consume. Wondering what I’m talking about? This is a problem I need to be especially mindful of in the winter because I love warm beverages. My go-to, up until recently, has always been hot coffee. I would drink it up until right before going to bed. Not the best idea. Now that I’m aware of the impact this habit can have on my sleep, I am more mindful of my choices. I still consume a considerable number of hot drinks on chilly days, but I’ve switched over to herbal teas instead. It also means caffeine can be addictive. This is a potential problem, especially if you’re trying to cut back your daily consumption. Have you ever tried to give up coffee for a period of time, only to find yourself plagued by headaches, fatigue, and general moodiness? Those are classic symptoms of caffeine withdrawal, and I know from experience that they are the absolute worst. The molecular structure of caffeine is very similar to adenosine, a chemical in our brains that alerts our body to feel fatigued. As we progress through our day, adenosine is released and attaches to receptors in the brain, telling us that we are tired. When we consume caffeine, those molecules attach to the adenosine receptors instead, blocking these “shut-down” signals from being sent. What time of the day is best to call it quits? Caffeine leaves the body gradually, making it important to cut off your intake well before you go to bed. It’s recommended that you stop consuming caffeine about six hours before you plan to sleep. But everyone’s different. Your body might need more time to process everything out of your system. When you eat or drink something with caffeine, it takes about twenty minutes for the drug to be absorbed into your blood and reach your brain. The coffee nap craze makes use of this time, encouraging you to sleep for those twenty minutes before the drug hits your system. Once there, caffeine remains present in your bloodstream for several hours. The half life of caffeine is an astonishing 6 hours. Meaning that if you drink a cup of coffee containing 100mg of caffeine, six hours later you will still have 50mg in your system. So we know coffee contains caffeine, but what about other foods? Are you aware that chocolate, made from the cacao nib, has caffeine too? Soda is another common culprit, both diet and regular. Most energy drinks contain high quantities of the stimulant, along with an array of other additives to keep you alert. Many pain medications are guilty as well, especially those designated for treating migraines. And don’t forget about tea! Black, green, and white teas, unless otherwise specified, all contain various amounts of caffeine. So make sure you stick to herbal in the evenings (and make sure it is labeled as caffeine free!). Sound like a lot to remember? Don’t worry! It gets easier. Here is a great list of popular foods/beverages and the amounts of caffeine they contain. You might be surprised where caffeine is currently hiding in your diet! So when you’re searching for something to nibble on tonight before bed, try and opt for a snack that helps promote sleep, rather than a few squares of dark chocolate. Your body will thank you! Relax, you don’t have to completely cut caffeine out of your diet to get a good night’s sleep. Believe me, I don’t want anyone making that sacrifice; it’s too cruel a concept to even mention. Instead, listen to your body, and try to be mindful of what you’re consuming and when. Do you find that you have a harder time falling asleep when you drink diet soda in the afternoon? Does your late-night scoop of chocolate ice cream always lead to a groggy feeling the next morning? Blame it on the caffeine and save those treats for earlier in the day.